As a valued client, you have been invited to participate in our brand new loyalty rewards program! To participate, click below to register for an account. Earn points by specifying projects, visiting the website, interacting on social media and more. Your point balance will reset yearly on the date your account is created. How can I view my total points? In order to gain points you must create an account by clicking “Register” at the top of the screen. After that you can use the “Log in” button to view your total points whenever you visit the site. Once you are logged in you also have the opportunity to view your total point history, which features a description of every activity completed and date completed. What should I do if I’m missing points? If your balance is missing any points, please use the form below to tell us the activity and points that you are missing. We will review each case individually and respond within 1 business day. How do I earn points for specified projects? You must register for an account before specifying a project to receive points. Points are earned for specifying a project once the purchasing order has been completed. Points for specified projects are added manually, so please use the form below to fill out project information and your point balance updated. Please enter your specified project info below to receive points. 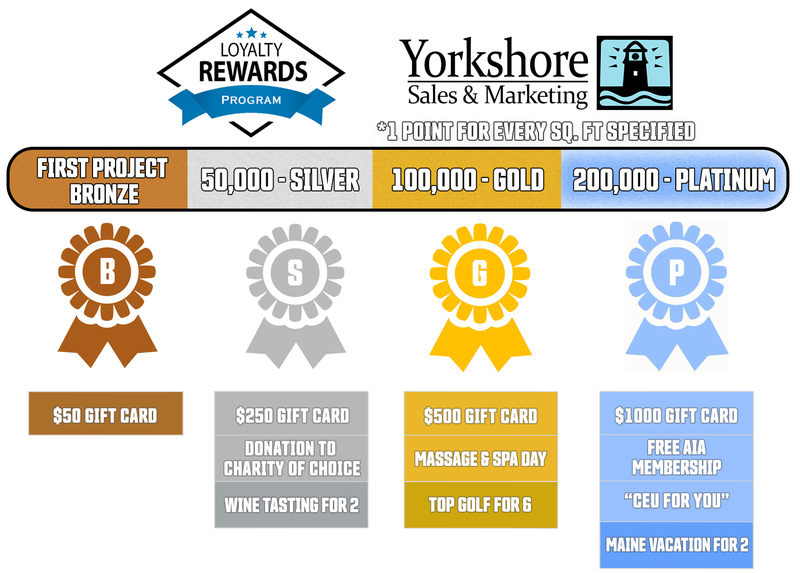 Reward Program Details – Rewards account must be created before specifying a project in order to receive points. Project points will be added once material is ordered and paid. Total points will expire 1 year after registration. Yorkshore maintains the right to disqualify any project that does not meet the above criteria.